Climate Upheaval Forcing Emigration - Planet Aid, Inc.
July 26, 2018 Updates: A new report published by The World Bank in March says that climate change will lead to the forced emigration of over 140 million people by 2050. Since the writing of this blog, another 2.5 million have had to emigrate according to the UNHCR. 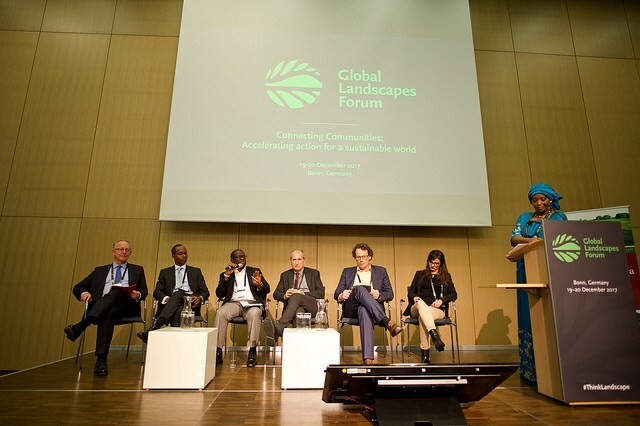 The 2017 Global Landscapes Forum was held in Bonn, Germany Dec 19-20. One thousand attendees from 103 countries, along with thousands more via social media and live coverage, came together to learn, share, and act around the planet’s largest climate and development challenges. The talks and panels focused on climate restoration, food and livelihood, minority rights, finance, and much more. The below article covers a panel that addressed the issues of land degradation and forced migration. These are two problems of high concern in sub-Saharan Africa where many Planet Aid-funded projects exist. The changing climate has led to both land degradation and forced migration, and swift change needs to be made before they destroy even more. Some 66 million people have been forcibly displaced around the world and mass disruption is creating ongoing challenges. Climate change, human need and conflict are exacerbating the impact of land degradation on human settlement patterns, experts say. The pros and cons of migration were at the center of a discussion on land degradation, migration and resilience at the Global Landscapes Forum conference in Bonn, Germany last month where panelists discussed the difference between natural and forced migration. Although migration can have negative consequences, it can also be the source of positive socio-economic transformation and stability through remittances when people send money home, said Klas Sander, a senior economist at the World Bank. For example, improved financial status may mean that communities can pay for fuel for cooking and heating rather than clearing the landscape of shrubs and trees to burn. Historically, migrants to the Americas were fleeing harsh conditions as part of a strategy to be resilient and survive, said Erick Fernandes, an adviser on agriculture, forestry and climate change for the World Bank. “Migration as a strategy for people to survive climate change is not surprising, and a major driver forcing people to move,” Fernandes said, adding that countries most affected are conversely not primary contributors to climate change, although they are now paying the price for degradation, which has already occurred on at least a quarter of the Earth’s land surface. Due to climate upheaval, a cycle of shrinking available natural resources, disappearing traditional livelihoods such as livestock herding or subsistence farming, and related conflicts over land and water use can cause people to leave in search of better opportunities. Such displacement is particularly affecting rural communities with high poverty, and places with large populations of young people, added panelist Louise Baker, co-ordinator for external relations at the U.N. Convention to Combat Desertification (UNCCD). Similarly, there are 200 million young people in Africa who will be in need of employment by 2050, she said. Globally, there are 2 billion hectares of land-degraded ecosystems – an area larger than South America — and 500 million hectares are abandoned agricultural land, she said. Panelists advocated for international commitment and cooperation in addressing these urgent land degradation and resilience concerns. Key components include engaging with the private sector, scaling up financing, and promoting programs to help affected communities implement grassroots level changes to give people incentives to stay instead of relocating. Zambia, for example, traditionally dependent on the extractive copper industry, received a $36 million grant from Climate Investment Funds to develop resilience through diversification. Afghanistan has developed a natural resource management strategy and Italy has a national integrated landscape management strategy. Tunisia received $100 million from the World Bank to help communities living in rural, forested areas develop an integrated approach to managing the landscape sustainably, while allowing for grazing, wheat and olive oil production. Such innovation and collaboration between different stakeholders, from the local farmer to large international institutions, is seen as vital to rebalancing the changes brought by a warming climate and pressures on the landscape. So far, commitments to address land degradation have been made through the U.N. Sustainable Development Goals, the UNCCD framework for Land Degradation Neutrality, the U.N. Framework Convention on Climate Change (UNFCCC), the Global Partnership on Forest and Landscape Restoration (AFR100) effort in Africa and the World Resources Institute Initiative 20×20 in Latin America and the Caribbean, among others, delegates said. Such efforts help ensure degraded lands are not a fait accompli, although challenges remain. Panelist Peter Saile, senior forests advisor at the German government’s international development agency GIZ, pointed to recent success in land restoration in Africa, suggesting that innovation is vital. “It’s not necessarily about substantially new resources, oftentimes it’s more about redirecting resource flows,” Saile said. Article originally published as “Resilience and resources key to offsetting land degradation driven migration” on Landscape News.